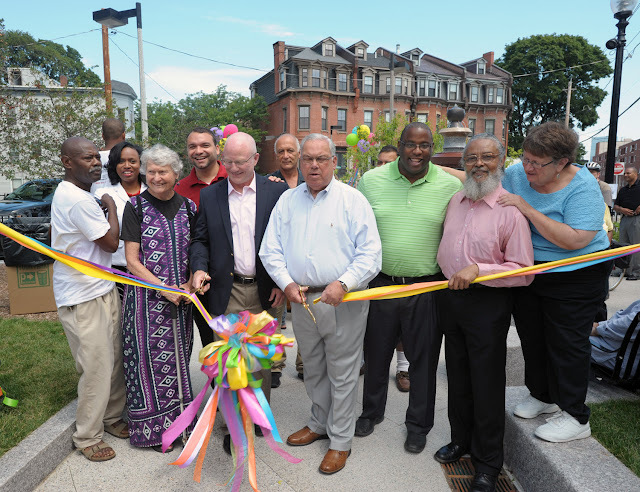 Mayor Thomas M. Menino joined the residents of Highland Park in unveiling the new Alvah Kittredge Park on Saturday, July 28th. The newly renovated park, located opposite HBI’s project at the historic Alvah Kittredge House at 10 Linwood Street, includes new walkways, granite walls, and other features such as historic lighting, tables, benches, new shade and flowering trees, a grass lawn, and a rain garden with native plants. The parks is also the front yard of the Alvah Kittredge Park Rowhouses, an HBI project completed in 2001. The reopening marks the completion of a $693,000 project overseen by the Boston Parks and Recreation Department. The design budget of $60,000 was funded by the Harold Whitworth Pierce Charitable Trust. The construction budget of $633,333 was funded in part by the Browne Fund for $100,000, the Henderson Foundation for $100,000, a Commonwealth of Massachusetts PARC Grant for $310,648, the Boston Grants Initiative for $3,000, and additional funding provided by the City of Boston’s Capital Improvement Program. Pro-bono community schematic design was provided by Carol R. Johnson and Associates, Inc., and the contractor was Ronald A. Marini Corp. The reopening celebration attracted more than 100 residents and included face painting, lunch and ice cream provided by H.P. Hood LLC, the official dairy sponsor for the Boston Parks and Recreation Department’s 2012 park openings.